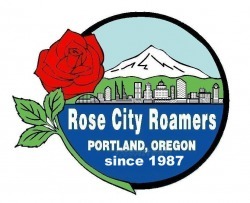 The Rose City Roamers is one of Oregon's award winning volkssporting clubs that is dedicated to providing several hosted, guided, and year round walking events for your recreation and fitness pleasure. RCR is associated with the American Volkssport Association, and all our walking events are AVA sanctioned. As with most AVA events, everyone is welcome to participate. We offer year round walks in North, Northeast, Southwest, and Southeast Portland in addition to one walk in Clackamas and two in Tualatin. Please check out our Year Round Event (YRE) section as we also have a route in Lake Oswego -- "River Run." To join ROSE CITY ROAMERS VOLKSSPORT CLUB -- click here to view and print a membership application form. General Meetings are currently being held in the Portland Adventist Medical Center, Education A, lower level meeting space. Check your newsletter or here at the website for changes to meeting room location.